At the age of 36, Caroline Knapp, author of the acclaimed bestseller Drinking:A Love Story, found herself confronted with a monumental task: redefining her world. She had faced the loss of both her parents, given up a twenty-year relationship with alcohol, and, as she writes, "I was wandering around in a haze of uncertainty, blinking up at the biggest questions: Who am I without parents and without alcohol? How to form attachments, and where to find comfort, in the face of such daunting vulnerability?" An answer materialized in the most unlikely form: that of a dog. Eighteen months to the day after she quit drinking, Knapp stumbled upon an eight-week-old puppy at a local animal shelter, took her home, and named her Lucille. Now two years old, Lucille has become a central force in Knapp's life: "In her," she writes, "I have found solace, joy, a bridge to the world." Caroline Knapp has been celebrated as much for her fresh insight into emotional and psychological issues as she has been for her gifts as a writer. In Pack of Two, she brings the same perception and talent to bear on the rich, complicated terrain of human-animal relationships. 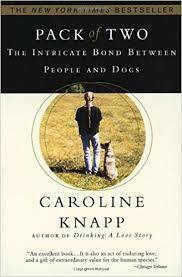 In addition to mining her own experience with Lucille, Knapp speaks to a wide variety of dog people--from animal behaviorists and psychologists to other owners whose dogs have deeply affected their lives--about this emotionally complex, sometimes daunting, often profoundly healing alliance. Throughout, she explores the shift in canine roles from working partners to intimate companions and looks, too, at how this new kinship, this wordless bond, becomes a template for what we most desire ourselves.